Dwayne Johnson has been one of the most hardworking actors in Hollywood. Coming off the success of Jumanji, comes Johnson’s second film of 2018 Skyscraper. Today the Skyscraper Official Trailer #2 dropped and Dwayne Johnson is taking on one of the tallest skyscrapers in the world to save his family. Make sure you watch the second trailer for Universal Pictures Skyscraper out in theaters on July 13, 2018, below! 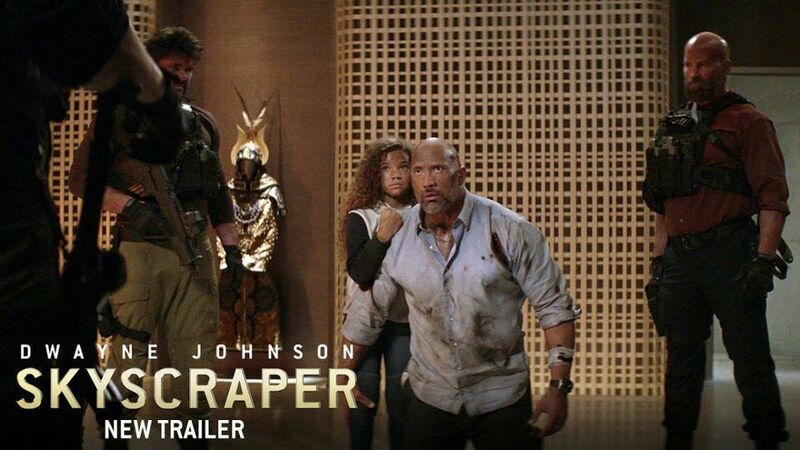 Global icon Dwayne Johnson leads the cast of Legendary’s Skyscraper as former FBI Hostage Rescue Team leader and U.S. war veteran Will Sawyer, who now assesses security for skyscrapers. On assignment in China, he finds the tallest, safest building in the world suddenly ablaze, and he’s been framed for it. A wanted man on the run, Will must find those responsible, clear his name and somehow rescue his family who is trapped inside the building…above the fire line. Skyscraper hits theaters on July 13, 2018. Are you excited to see Skyscraper? Share your thoughts on the trailer in the comment section below! This actually looks interesting and I love the Rock’s charisma in his movies. Can’t wait! ?Dwayne is good when he has good supporting actors outside of that I’m not a big fan. I will wait until Redbox for this one. This looks good and so does the rock. Look forward to seeing this! I will probably see this .. it seems a little redundant for his movies like a San Andreas mixed with rampage … but I saw both of those so I’ll gve this a shot too. Looks interesting but reminds me too much like a Die Hard movie. I’d still watch it though. The stunts seems far too unrealistic considering that the person is supposed to have a prosthetic leg. This looks like it’s going to have much action. Looking forward to watching! Not sure how I feel. Although I respect his hustle and this appears to be a solid movie, I’m starting to feel saturated. LOL… I’ll have to read or see your review to make a decision on this one. Well look who back in the movies; Neve Campbell!! I haven’t seen a movie by the Rock that I didn’t like!!! It maybe a Die Hardish type of movie but I can bet the majority of his fan base never heard of it!! So they will go see it!!! I agree with what someone else says as it does remind me of a Die Hard movie, but I love the Rock. I also like that with all the movies he has done lately his ex wife is listed as an exec producer along with himself. Die Hard with The Rock? I’m in! I can honestly say I’m hear for the eye candy. I’m hoping this movie is great so I will be watching asap.